Onychomycosis is a fungal infection in nails affecting approximately 10% of the population. The main cause of this pathology are dermatophytes, a type of fungus that distorts nail color as well as its shape and thickness, getting to destroy it completely if measures are not taken to combat them. The affected nails become yellowish, brown or with a deformed thick white spot that emerges from the nail bed. Fungi responsible for onychomycosis thrive in moist and warm places, such as pools, saunas and public toilets feeding on the keratin of nails until they are completely destroyed. Their spores, which can pass from animals to man, are very resistant and can survive for long on towels, socks or on wet surfaces. There are some risk factors that may favor the appearance of nail fungus in some people, such as diabetes, hyperhidrosis, trauma to the fingernail, activities that contribute to excessive foot sweating and pedicure treatments with not disinfected material. Today, the advances in medical technology allow us to have a new and effective method to treat nail fungus easily and in a non-toxic way: the Multidiode™ S30 PODYLAS laser. Multidiode™ S30 PODYLAS is proven effective in the treatment of onychomycosis and also in other type of injuries such as neurovascular helomas and Intractable Plantar Keratosis (IPK), becoming a podiatry tool for daily use. 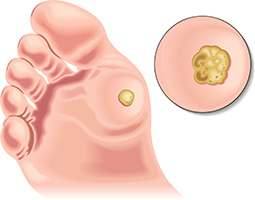 Plantar warts are painful lesions caused by the human papilloma virus. They look like corns with black dots in the center and appear in the soles of feet, varying in size and number. When plantar warts grow at the points of support of feet they are usually coated with a layer of hard skin, forming a compact plate sunk into the skin because of pressure. Multidiode™ S30 PODYLAS is a fast comfortable treatment tool to get rid of plantar warts. The procedure is performed by applying the laser over the entire surface of the wart once the infected area has been removed. Depending on the case, you may need from one to various sessions of treatment. The Dermalase™ system also treats onychomycosis effectively and without side effects. Studies with INTERmedic’s 1064nm confirm a healing rate of 85% in cases of onychomycosis, after 3 sessions. Multidiode™ S30 PODYLAS is applied to the infected nails and surrounding skin, alternating horizontal and vertical passes, so that there are no untreated areas. Light energy penetrates to the nail bed, destroying fungi. The average duration of a session is about 10-15 minutes, depending on the number of affected fingers. Treatments are painless, simple, fast, effective and with no side effects. INTERmedic’s new Multidiode™ S30 PODYLAS is a revolutionary laser for the treatment of nail fungus, plantar warts, neurovascular helomas, IPK, Low Level Laser Therapy (LLLT) and also for minor podiatric surgery. Today advances in medical technology allow us to have a new effective non-toxic method to treat nail fungus: Multidiode™ S30 PODYLAS laser procedure. Multidiode™ S30 PODYLAS is applied over the infected nails and the skin surrounding them, alternating horizontal and vertical passes to ensure the treatment of all the infected area. Laser energy penetrates up to the nail bed, destroying fungi. Each treatment session is about 10-15 minutes per both feet, depending on the number of affected fingers. The treatment is painless, fast, effective and has no side effects. Dermalase ™ is the most comprehensive and complete solution of INTERmedic for skin care with the most advanced laser technology. The platform works with 1064nm laser, a wavelength that allows to destroy nail fungus without damaging healthy tissue. Dermalase ™ is effective, achieves excellent results and has multiple applications in cosmetic dermatology.